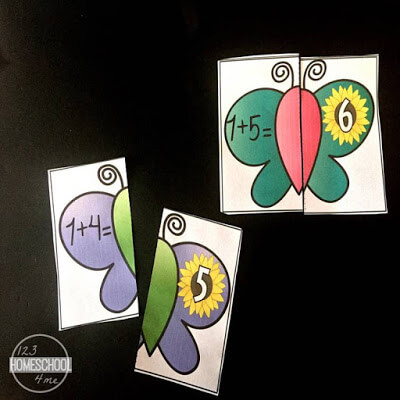 These fun addition to 10 butterfly puzzles are a fun way to get your kids to learn their addition facts. This Butterfly Addition Puzzles include an addition mat to help the kids show their learning. Adding within 10 is an important skills for your students to learn as they build on their addition skills. 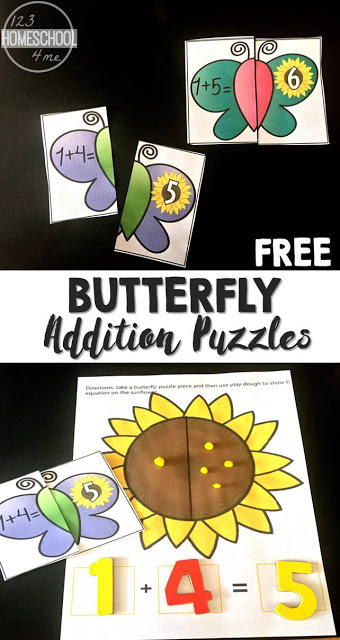 These fun Butterfly Addition Puzzles will be a hit with your students! The colored butterfly puzzles can be used as a stand alone activity or along with the sunflower addition mat. I like to get the students familiar with equations as early as possible. With puzzles like these, it helps them identify the relationship between the numbers and the items. Eventually, they will be able to make the link that adding up the two digits will give us a sum of the items. 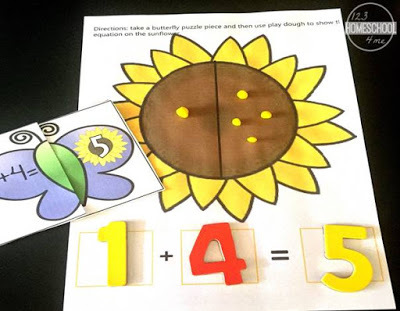 For example, I had the kids build their puzzle, then build the number of butterflies using dough on the mat and then place the magnetic numbers (you can use dry erase markers on the mat instead of magnetic numbers) on the mat below their puzzle. You can definitely choose the numbers and equations that you want your students to practice on. Download the Butterfly Puzzle Cards and Mat below. Stack the puzzle cards in one pile and the mat in the center. I chose to print and laminate more than one mat (one for each pair of students) so that I can see them working individually on their addition skills. The kids will pick a puzzle card and read the numbers on the equation then add up the numbers (most kids will use their hands to add them up at this stage). They then look for the number sum with the matching puzzle piece and build their puzzle. I use play dough in this step: have the kids pretend that the balls they will make are ‘butterflies’ and they have to build their equation on the mat. You can use the mat as a stand alone and write the numbers below and have the kids building their equations with play dough that way too!